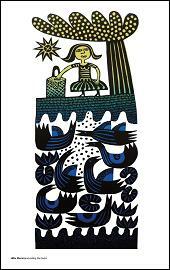 This tea towel shows an outstanding linocut by Hilke MacIntyre. It is a beautifully composed image that exemplifies Hilke’s art, a figurative style combined with a strong abstract pattern. She takes a simple scene of a woman feeding ducks and makes it magical, seducing us with powerful shapes and dynamic colours. This tea towel is wonderfully bold and can not be ignored.